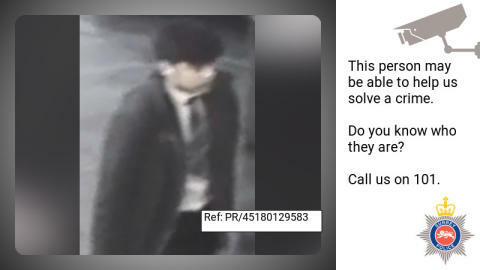 We have released a CCTV image of a man we would like to speak to as part of our ongoing investigation into a sexual assault involving a 12-year-old girl in Epsom in December 2018. The 12-year-old victim was walking home from school along Chessington Road between 3.40 and 4pm on December 5 when she was approached by the suspect. He made comments about her make-up and shirt and then touched her inappropriately. He is described as aged 15-16 years, of Asian appearance, with black straight hair which was longer on the top than the sides. He was between 5’6” and 5’8” tall and of a slim build, with stubble above his mouth and chin. He was wearing a navy blazer with a yellow trim, white shirt, black tie, black trousers and black shoes. Detective Sergeant Stephen Muncaster said: “We have released this CCTV in the hope someone may recognise the person and come forward with the information we need to bring whoever was responsible for this offence to justice. Anyone with any information should call 101 (999 in an emergency) or http://surrey.police.uk/TellUsMore quoting reference PR/45180129583.